International Conference on Genetic Engineering & Genetically Modified Organisms from August 12-14, 2013 at Raleigh, North Carolina, USA. Since the days of Dolly, Genetic Engineering as a discipline has been advancing rapidly and its applications are far and wide for the betterment of humanity. Genetic Engineering is a study that allows controlled manipulation of genes to produce expected results. This is a knowledge that can be used meticulously to detect and save humanity from dreadful diseases, genetically modified crops and animals are beneficial to the society as they could address the issues of inherited diseases by manipulating the genetic system. OMICS Group International Conference on Genetic Engineering & Genetically Modified Organisms from August 12-14, 2013 at Raleigh-Brownstone-University, North Carolina, USA, promises loads of useful information among researchers and professionals in the field of genetic engineering. The Genetic Engineering conference is an exciting event involving learners and professionals in genetic engineering. Renowned speakers and delegates would discuss ways to apply the advances in genetic engineering for treatment of genetic disorders, in addition to measures like gene therapy. The delegates are also expected to conduct poster presentations and plenary sessions in recombinant DNA technology and emerging areas like genetically modified products. 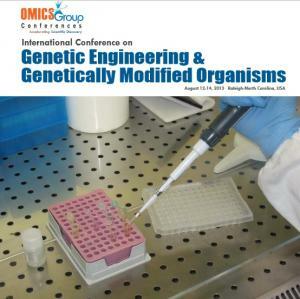 The special issues of OMICS Group journals like Advancements in Genetic Engineering: Open Access, Human Genetics & Embryology: Open Access, and Gene Technology: Open Access carry the respective abstracts presented at the conference, as part of the special corresponding issues.